Lake Ridge Academy dedicated its second major solar structure on campus on Thursday, October 3rd. 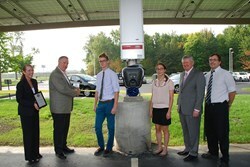 Lake Ridge Academy dedicated its second major solar structure on campus on Thursday, October 3rd. This renewable energy installation is an 18 kW system mounted on a car parking canopy. The array features 72 250 watt solar modules that have a life expectancy of more than 30 years. The canopy provides shade for six cars and features an electric car charging station. Lake Ridge Academy President Carol Klimas welcomed the opportunity to work together with Cleveland-based Solar Action, LLC on the company’s second solar project on the school’s campus. The solar canopy structure follows the 400 foot 105 kW solar array the school had installed in 2011 as part of Lake Ridge Academy’s environmental education program and commitment to sustainability. Solar Action, LLC will own and operate the system selling Lake Ridge Academy all of the solar generated power for a rate that will be less than standard utility rates. Cleveland-based Bold Alternatives designed and installed the solar array in time for the school’s 50th anniversary celebration in early September. Bold Alternatives is a NABCEP certified solar PV professional installer located in Cleveland, OH and is a veteran owned small business. “We are very pleased to bring additional solar to Lake Ridge Academy,” said Rob Martens, President of Bold Alternatives. The solar canopy has already inspired one member of the Lake Ridge Academy community to purchase an electric car. Collection Auto Group provided additional electric car models for the ceremony on Thursday. To learn more about Lake Ridge Academy’s commitment to solar power and environmental science program, contact Stacie Foor at Lake Ridge Academy, 440.327.1175 ext. 9111. To learn more about Lake Ridge Academy, visit: http://www.lakeridgeacademy.org.